The Common Core State Standards Initiative website states the following Mission: The Common Core State Standards provide a consistent, clear understanding of what students are expected to learn, so teachers and parents know what they need to do to help them. The standards are designed to be robust and relevant to the real world, reflecting the knowledge and skills that our young people need for success in college and careers. With American students fully prepared for the future, our communities will be best positioned to compete successfully in the global economy. Unfortunately, the feedback is not that glowing. Confusing, destructive and dismal results are terms used to describe the initial implementations. However, 46 states are already implementing these standards, so we are already well down a path that does not look promising. Only Alaska, Nebraska, Texas and Virginia have not signed on to the standards. Tonight is the night Indiana Gov. 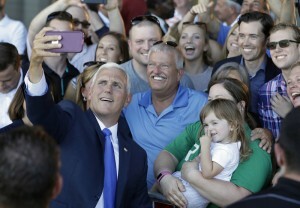 Mike Pence will take the stage in Cleveland at the 2016 Republican National Convention. He is now, officially, the vice-presidential running mate of Republican nominee Donald Trump. But before that happens, we want to take a dive into Pence's education policies in the nearly four years he's been the governor of Indiana. Just how much does he have in common with Donald Trump when it comes to schools and education? Definitely not nothing. Let's take a look. Common Core "Got to get rid of Common Core — fast." That was Trump just before presenting Pence on television to the nation as his running mate last Saturday. And at one point a couple of years ago, it seemed Gov. Pence would be the trailblazer to do just that: be the first state leader to repeal Common Core (the national math and English education standards) after having adopted it at the state level. But it didn't totally turn out that way. Let's go back to 2010, when Indiana's former Republican Gov. 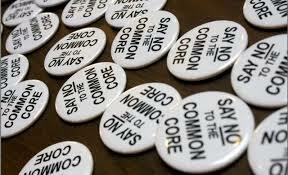 Mitch Daniels and the GOP-controlled Statehouse wholeheartedly endorsed Common Core for Indiana. Three years later, when Pence took office, local Tea Party groups and other activists began a campaign to repeal the standards they saw as a federal overreach into classrooms. Then, in 2014, Pence signed into law a withdrawal from Common Core and promised a quick turnaround for new school standards, "written by hoosiers, for hoosiers." But many anti-Common Core advocates felt betrayed by the results — because of similarities between the math and English portions of Common Core, and Indiana's new guidelines. Other critics of Indiana's education standards have taken to social media the past week to remind people "how bad Mike Pence is on Common Core." School Choice If "School choice is where it's at," as Trump said when he appeared on television with Pence on Saturday, then Indiana is where school choice is at. That's because under Gov. Pence, the growth in the number of charter schools and the use of private school vouchers have exploded. After the voucher program survived a state Supreme Court challenge in 2013, it's grown into one of the largest in the country. Creating a pre-K pilot program was one of Pence's top legislative priorities for the 2014 legislative session, even as many of his Republican colleagues in the General Assembly opposed it. At that time, Indiana was one of only 10 states without state-funded pre-K. Eventually he negotiated the On My Way Pre-K pilot program. Over the past two years, it's provided scholarships for nearly 2,300 low-income 3- and 4-year-olds. While many cheered Pence for the program, he faced major criticism later in 2014 after refusing to let the state apply for $80 million in federal money to expand it. He claimed he didn't want "federal intrusion" into the program, but reversed course last month. Rivalry At The Top When Pence was elected in 2012, Indiana's education policies on school choice, teacher evaluations and school grades were in the middle of major adjustments. And then there was the new state superintendent, Glenda Ritz, a Democrat. She'd just won election, too, in a surprise victory over a Republican incumbent. An already tense relationship between Pence and Ritz erupted in 2013 after Pence signed an executive order to create an education agency supporting his appointees on the State Board of Education that Ritz oversees. Since then, the two have fought over the length of the state's standardized test, differences on No Child Left Behind, and whether to seek federal funding for pre-K.
Then Pence signed a bill requiring the state education board to elect its own chair in 2017, taking some power away from Ritz's position. She accused him of attempting "a complete takeover" of education policy. But the two have landed on some common ground — even if they didn't get there together. Last year, Ritz warned that scores on a statewide test would plummet because of changes to the test. Teachers, she said, should not be held accountable for scores that year. Pence and GOP lawmakers disagreed on suspending accountability. But when the pass rate dropped by 22 percent statewide, Pence signed a bill that paused sanctions on teachers and schools for the low scores. Many argue that those low marks were a result of a more challenging test designed after Pence repealed Common Core in Indiana. Congress admits that Common Core now will be federal law and that it is not about academic learning but rather changing the beliefs, values, behavior and worldviews of students. In a nutshell, the government is conducting psychological profiling of our children. Like Obamacare, the Every Students Succeeds Act which reauthorizes the Elementary and Secondary Education Act, is unconstitutional and a government takeover – this time it’s education. Voters can thank our elected Congressmen, led by Speaker of the House Paul Ryan, R-Wis. — who promised new and better leadership — we are getting ObamaCore! On December 2, the U.S. House of Representatives passed the conference report for ESSA. As with Obamacare, all Democrats voted for the bill while Republicans were split 179 in favor to 64 against. As I watched the House proceedings prior to the vote, I was shocked to hear Rep. Tim Ryan, D-Ohio, announce that Common Core is being redefined as social-emotional learning, which must come first in the learning hierarchy — with academics taking a backseat. Not to be outdone, Republicans weighed in effusively as Speaker Ryan, in a prepared statement, said that he is proud the legislation includes language to help expand and make the teaching of social and emotional learning more effective! Rep. John Kline, R-Minn., chairman of the House Committee on Education and the Workforce, boasted that Republicans compromised on the details but not on their principles. That’s the problem! Establishment politicians voted their own principles, ignoring the thousands of voters who have been protesting the bill for months. In public schools, the monitoring of student progress in non-cognitive attitudes, behavior and mindset is already in full swing through cooperative learning — collectivist groupthink — and frequent testing.